Study in USA! Who says it’s out of reach? Set in the spacious garden of Waranan and Preecha Pongcharoenkul, the Chiangmai Choral Society held a most successful concert for friends last weekend. Almost 100 people were treated to sundowners, dinner, and delicious bites from ‘The Fondue House’, with everyone enjoying each other’s company, while well known flautist Ajarn Xavier supplied background music. 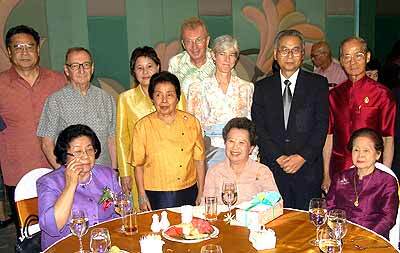 The Choral Society’s multi-cultural choir. Pitijet Vichitporn (aka Ajarn Xavier) is a native of Chiang Mai who has already performed for Their Majesties the King and Queen of Thailand. 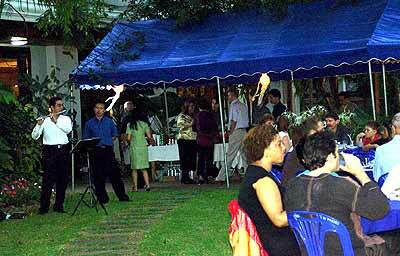 Last Sunday he played for music lovers in the garden of Waranan and Preecha Pongcharoenkul to get people ‘in the mood’. The concert started with The Kings Anthem, followed by Broadway tunes-from ‘My Fair Lady’. Several all-time favorites, which the audience visibly enjoyed, included ‘I Could Have Danced All Night’, ‘Rain in Spain’, ‘Get Me to the Church on Time’ and the popular ‘I’ve Grown Accustomed to Her Face’. Pat (Naruntap), a rather new face for the audience, performed a medley from ‘Fiddler on the Roof’, accompanied by pianist Sid Richarson. It was intended to give the event more of a ‘homely’ feeling, rather than the usual ‘concert’ atmosphere, a fact that was appreciated by all. Not only were the singers relaxed and ‘all smiles’ during the whole concert, but also conductor Rainy Riding appeared to be very much at ease. Pat (Naruntap), a newer face, received huge applause after the performance of a medley from ‘Fiddler on the Roof’ and ‘Les Miserables’, accompanied by pianist Sid Richarson. 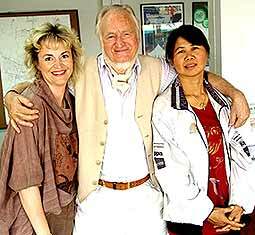 We learnt later that he used to be with a Symphony orchestra in the United States and enjoyed the challenge this multi-cultural, multi-linguistic Chiang Mai Choral Society gave to him. The audience thoroughly enjoyed themselves, and will most probably all be seen at the Choral Society’s next performance which is scheduled for July 4, at the US Consulate General’s Independence Day celebration. 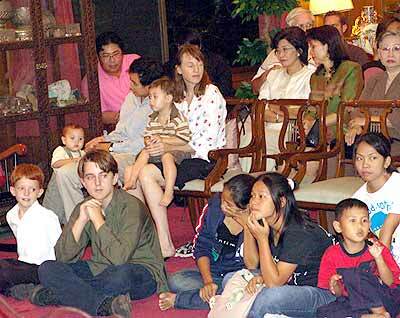 Young and old, Thais and foreigners, sharing a love for music, appreciated the hospitality shown by Waranan and Preecha Pongcharoenkul. Conductor Rainy Riding is very much at ease. An international educator and frequent guest of CMU’s International Center, Dr. John Driscoll, will be visiting Chiang Mai to speak on new trends in US university education, and to discuss those issues with teachers, students and parents. Dr. Driscoll will go over current issues for international students studying in the United States, and provide useful options for US higher education. Dr. John Driscoll is the Program Director of California State University-East Bay (located in the San Francisco-Silicon Valley area of California), a university which has a good understanding of Thai students through its long term relationship with Thammasat University, Bangkok. The talk has been organized with the cooperation of ‘The American Corner’ and ‘CMU Main Library’. Dr. Driscoll will be hosted by IC-ACE, the North American educational advisory and specialized English training division of CMU’s International Center and is part of IC-ACE’s “Distinguished Speakers Series”. The event will be held at the 3rd Floor Mini-Theater of CMU’s Main Library on July 5, 2005 from 2.30-4 p.m. Refreshments and materials will be provided for guests who register in advance - seats are limited, so you are advised to book early. Advance Reservations are available by contacting IC-ACE: 0 5394 2896, [email protected], or at their office in CMU’s International Center (next to the fitness park, off Nimmanhemin Road). 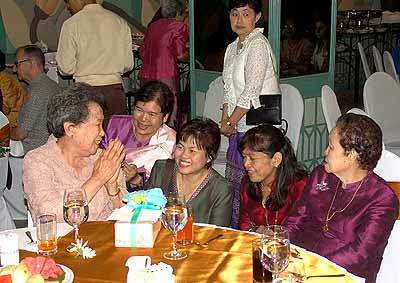 Over the past 41 years Khunying Buphan Nimmanhaeminda’s contribution to society has resulted in the latest recognition she has received from HM King Bhumibol Adulyadej the Great. Khunying Buphan Nimmanhaeminda was all smiles while people were lining up just to hold her hand and tell her how grateful they were for her never to have stopped giving support. The Payorm Room at the Amari Rincome Hotel was filled to capacity with the guest list reading like a ‘Who’s Who’ of Northern Thailand. Everyone was there with one purpose, and that was to give their best wishes to one of the most honored senior citizens of Chiang Mai, Khunying Buphan Nimmanhaeminda. Khunying Buphan has become an integral part of the local culture and most of her immediate family, her children, and grandchildren, all substantial figures in their own right covering many fields of endeavor, were present during the celebration of her award. Garlands of flowers were submitted from representatives of different schools of Northern Thailand, recognizing the fact that at 83 years of age, Khunying Buphan can look back on a lifetime involved in education and service to the people. She sat smiling in the midst of friends and family and said, “For me, the best thing in life is to see people smile and be happy.” She still is involved in supporting two homes for the elderly, pre-school child care services, medical services for all members and a scholarship fund for the third generation children of the New Life Foundation (under Royal Patronage). Khunying Buphan Nimmanhaeminda, a true lady of Chiang Mai, has set an example which hopefully will inspire others and make her charities successful for a long time to come. Don’t ever say that 86 is too old! Canadian Hermann Kleefisch will soon prove you wrong. A widower after 50 years of happy marriage, he decided it was time for an adventure and embarked on a nine month journey through 30 countries and four continents in a 1990 Volkswagen van, decorated with a funny yellow dragon. Listening to him was like a fresh breeze, fascinating to hear about fishing in the Philippines, dining with families in Korea and even finding a new love in Chiang Mai. This has led Hermann to start yet another adventure and soon he and Ta will be married. But it would not be Hermann if this were just ‘another wedding’. The plan now includes elephants, a white tuxedo and a bride dressed in Lanna style. One can only wish that we could grow older, just like Hermann, with a happy heart and a happy mind. His adventures are all recorded and available in a richly illustrated book. If you want a copy of his book to learn his secrets, please call his fianc้e Ta on 0 1 030 1054 or email: cloverfishherm @hotmail.com. Although the French composer Claude Debussy wrote his last piece of music in 1918, the year of his death, it took almost one century for his composition “Intermede For Piano”, created in 1880, to have its first performance. Till its premiere in 2002 the manuscript of Intermede had been hidden in a private library. Up till now, there has been no Asian performances. 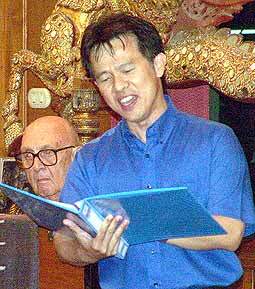 The first is going to be given by Bennett Lerner during the Opening concert of A Debussy Festival on Friday, July 8, 2005 at Gong Dee Studio. That memorable concert will have two other premieres as well. Thorsten Wollman wrote especially for this concert “Prelude For “Dr” Claude” for clarinet and piano. Wollmann is Payap’s resident composer, internationally-known as a jazz composer and film scorer. This piece celebrates the doctoral degrees of Dr. Thorsten (composer), Dr. Bennett (piano) and Dr. Chaipreuk (clarinet), all of which were sponsored by Payap University and completed in the last four years. The third premiere is called “Debussy”. It is a composition for klui (Thai flute) and guitar, and has been composed by Bringkop Vora-urai. Ajarn Bringkop is the head of Payap’s Music Department and a distinguished ethno-musicologist. He will play the klui, with Passakorn Phuprapha as the guitarist. For more information on A Debussy Festival, see Community Happenings.